Koi pond bead filters are a type of water filter designed for filtering garden ponds or koi ponds. A filter keeps a small pond clean and looking good. 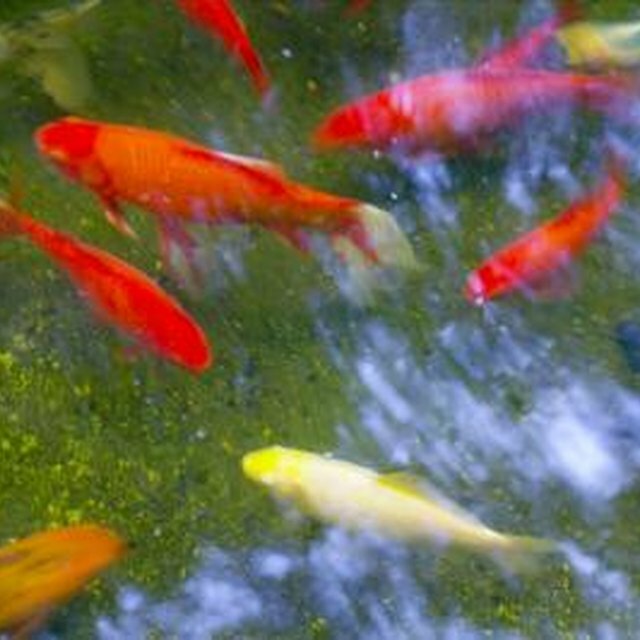 For ponds with fish in them, this is crucial for the survival of the fish. Bead filters are more effective than sand filters, and they require less cleaning and less backwashing. In addition, bead filters are more effective at removing fish waste and feces than sand pumps. Garden ponds can add a nice landscaping detail, but they can get dirty quickly. Locate the old pool sand filter tank. It looks a bit like a oversize grill propane tank with a ribbed fiberglass surface rather than a smooth surface. Locate the inlet and outlet PVC pipes. Turn off the pump and disconnect it from the power supply. Loosen the multi-port connection from the pipe system to the filter. This connection is a large PVC circle with multiple pipes on it. It is a disclike shape. The only connection you need to loosen is the one from the multi-port to the filter housing. Cut through the pipes connecting to the sand filter housing, a few inches back from where the pipes connect to the sand filter housing. Remember, the sand filter housing is shaped like an oversized propane tank. Use either a hacksaw or a cordless power saw. Note that some models may have drain pipes to the ground that you'll need to cut as well. Do not be surprised if some water comes out. Unscrew or loosen bolts holding the pump filter to its stand. Lift out the filter housing. Be careful as the pump may be filled with heavy sand. You can discard the housing. Use a hose connected to water line to flush out the pipe system. Insert the tip of the hose into various pipe openings and run water through. Clear away the space where the old filter was to make room for the bead filter. Position the new filter so the openings line up with the correct pipes (such as in, out and drain). Connect the multi-port connection to the new filter housing. Tighten fully before proceeding. Line up the pipes and connect them to the matching ports on the bead housing. If the pipes don't reach you'll need to measure and cut a few PVC connection pipes to make the connect. Measure from about 2 inches onto the original pipe to about 1 inch further than the opening of the port. This ensures enough space to connect and create a seal. Apply PVC cleaner (known as purple cleaner) to the ends of the pipes and connectors before proceeding. Hook up all of the pipes using connectors as needed. The connectors are PVC couplings that allow you to connect either two PVC pipes together or a PVC pipe that is slightly too short to a port or another pipe opening. Apply ample PVC glue around all seams, connectors, and where pipes meet the ports. Allow the glue to fully dry before proceeding. Open the top of the new filter housing and pour in the beads. Then fill the housing most of the way with water. Install the pressurized cap that came with the bead filter and use the included tightening tool to create a pressurized seal by tightening the cap. Double-check all connections, then turn the pump on. Allow it to run for a few minutes to get it pressurized, then check for leaks. If you see leaks, turn the pump off. You can try tightening fixtures or applying PVC glue to dry connections; otherwise, apply plumber's putty or caulk around connections where you discovered leakage.